For some people, the leftovers are the best part of Thanksgiving. As much we look forward to the traditional feast of turkey, stuffing, cranberry sauce, potatoes, green bean casserole and pumpkin pie (along with whatever else your family includes in their menu), sometimes after all the anticipation, the traditional food can seem a bit too dull and predictable. Plus, there’s often so much food heaped on the table at once that it’s difficult to absorb it all. Leftovers don’t have the same drawback: meal components can be reconfigured into a thousand different items — turkey soup, chili, hoagies, potato pancakes and more — so there’s always a surprise, plus leftovers are usually frozen and consumed over time, which means each dish can be savored. There’s a point to this post beyond making your mouth water as you await Thanksgiving Dinner. 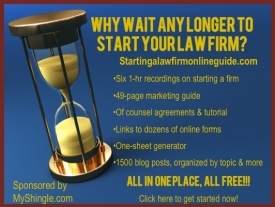 Believe it or not, your law firm’s content creation has a lot in common with Thanksgiving dinner: it’s typically high-quality but predictable fare (how-to’s, client memos and briefs on emerging issues, blog post summaries, and CLEs) that’s dished out to prospective clients and colleagues along with thousands of other pieces of contents in a steady, continuous stream. As a result, just like at the Thanksgiving table, it’s easy for readers to first overindulge on content, then feel so sick in the aftermath that they never want to see it again. That’s why recycling and repurposing content makes so much sense. Over the past year, most likely you or firm created some form of content or intellectual property assets in the form of blog posts, bar journal or newsletter articles, CLE presentations or briefs and memos and important legal issues for clients. Yet many of your prospective clients and referral sources may have missed your content in the rush of white noise that is the Internet. Others may have simply pushed it aside because the particular mechanism you chose to convey the content wasn’t effective for a particular reader. Do you have a heap of blog posts covering an emerging issue or a particular court’s rulings? You can compile the posts into an annual report for clients and colleagues. You could also download and include some of the key cases discussed for an extra value-add and for the convenience of readers who can have all the information together in one place. I’ve been doing an annual round-up of DC Circuit energy cases for years now, and it’s always eagerly anticipated by my colleagues. Present any CLE this year? Why not pull out your slide deck and record yourself presenting on the topic with a tool like Soapbox and then share the video with your newsletter list or on YouTube – or better yet, upload it to Udemy and charge money for your program. Did you master a hot new practice area in 2018 – one where clients or colleagues are itching to pick your brain? You can sell your knowledge by offering a one-to-one learning session through an online self-scheduling platform and charge a fee for your consults. Many lawyers view recycling as cheating – a way to get more mileage out of content by dumping it in a different form on clients – sort of like re-gifting. But the point is that repurposing content doesn’t have to be that way – it can be reconfigured to provide value to those who missed it or didn’t appreciate it the first time around or updated with minimal effort to provide benefits to first-time readers. And if done right, you may discover that your recycled content eventually becomes as popular as Thanksgiving leftovers.